1908 | Remains of L.A. 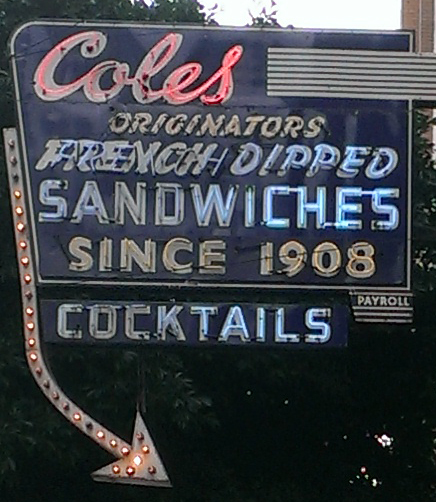 I went to Philippe’s yesterday, so it seemed only right today to go to Cole’s— the other downtown restaurant opened in 1908 that claims to have invented the french dip sandwich. I took the bus, partly because parking’s a pain and gas is expensive, and mostly because it’s fun to sit and read and look out the window at neighborhoods I don’t often see. I got off the bus a little early and went to see the mural commemorating Biddy Mason, a former slave who became a midwife and wealthy landowner in 19th century Los Angeles. Categories: Restaurants | Tags: 1908, downtown los angeles, dtla, french dip, Los Angeles, tater tots | Permalink. 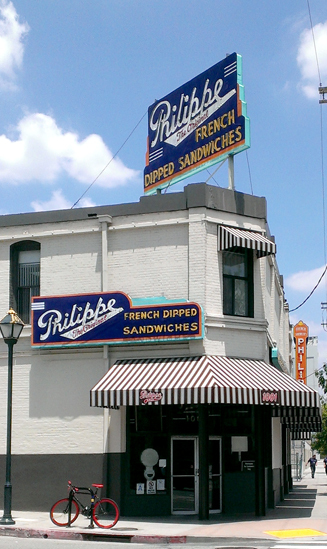 Philippe the Original, which is always just called “Philippe’s,” claims to have created the french dip sandwich. I say “claims” because Cole’s, which is also downtown and opened the same year, claims the same thing. I’m planning on going there soon. I don’t think it matters a lot who did it first, as long as they’re both delicious. David (my husband) and I got to Philippe’s around noon, wanting to see it during the lunch rush. It was bustling but not overwhelming; he says he’s seen it with lines out the door. -Everything about this place screams “been here forever” but not like it’s falling apart. It’s all very clean and well kept, just reeking of old-fashioned goodness. Strong wooden booths, long communal tables, sawdust on the floor. Categories: Restaurants | Tags: 1908, downtown los angeles, dtla, french dip, Los Angeles, Restaurants, sandwiches | Permalink.